A genuine Saharan (he comes from Adrar, the main town of Touat) Mohamed Achour Kherazzi knows his country. 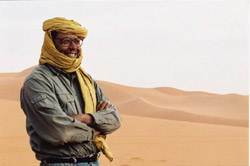 He has traveled its length and breadth including all parts of the Sahara, especially the area of Touat-Gourara-Tidikelt, of Mzab, in the Saoura Oasis, The Western Erg, The Hoggar, The N'ajjer Tassili and as far as Mali, Niger and Libya by 4x4, by truck, on camel or even by foot ! 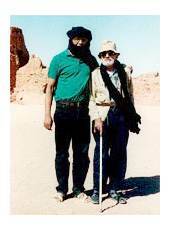 It was quite natural for Mohamed to want to put his knowledge of the desert to good use, organizing tours, camel treks and expeditions to visit, discover or explore. Of course, Mohamed Achour Kherrazi has real knowledge of people and of their Mohamed Kherrazi has deep knowledge of the people here, and of their environment. This makes him an exceptional tour-guide. he is also kind, and has a pleasant manner, which is no bad thing. His reputation has already enabled him (without even having to publicise his services) to accompany many groups (Spanish, Italian, French...) in addition to personalities such as the great French explorer and scientist Professor Theodore Monod. Later on, with the Paris-Dakar Rally, for instance, Mohamed Achour Kherrazi again displayed his talent and showed his considerable skills, experience and dynamism. A tour with him is an opportunity to escape into the depths of a civilisation whose environment and culture are unrivalled in the world.